The 100 or so schoolchildren – mostly from Africa and the Middle East – took part in a rally, AFP reported. They were wearing bright wight t-shirts imprinted bearing the phrase "Is this white enough for you?" Their message was that they wanted more Dutch native classmates to help them integrate. "When, for different reasons, a school 'becomes blacker', it's very difficult to reverse the trend," the schools' spokesperson Diane Middelkoop said, AFP reports. "White children's parents no longer want to be part of the school. I can understand that: We all want to feel at home and that means that we want to see people who share our origins and culture." "It's shameful that it's come to this, that children have to take to the street to go to school with white children,"AFP quotes one elderly local resident, also an immigrant from Suriname. In order to help their children integrate into society, parents were going door to door distributing flyers saying "We're looking for white pupils." 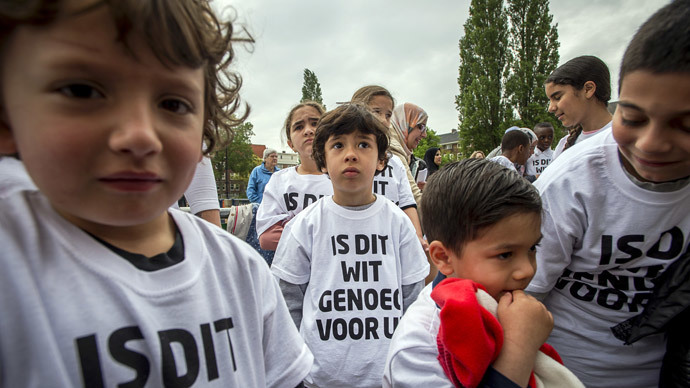 "I want my children to be integrated in Dutch society and to learn about different cultures," said one of the marching children's mother. But as migrant numbers rise, so does the support for far-right and anti-migrant politicians. One example is the Party of Freedom, currently holding 10 percent of the Dutch Parliament's seats, and its founder Geert Wilders, who blames migrants for not integrating enough.